Built ahead of the 1990 season, this CK6 was a Kremer factory entry. During the regular season, it was fielded in Kenwood colours usually with Bernd Schneider and Sarel van der Merwe behind the wheel. For Le Mans, it was finished in a very distinct livery created by German artist Peter Klasen. Driven by Philippe Alliot, Bernard de Dryver and Patrick Gonin, it finished 16th overall after starting in 19th. After the 1990 season, it served as spare car until it was pressed into service again for the 24 Hours of Le Mans in 1993. Entered by Kremer for Almo Copelli, Steve Fossett and Robin Donovan, a fuel pump issue prevented it from reaching the finish. 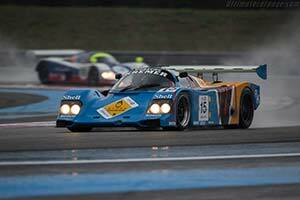 Now in Belgian ownership, it has been restored to its 1990 Le Mans livery. It remains as the only 962 ever to race as an art car.